Hey guys! It’s summer time and our little ones are on vacation! 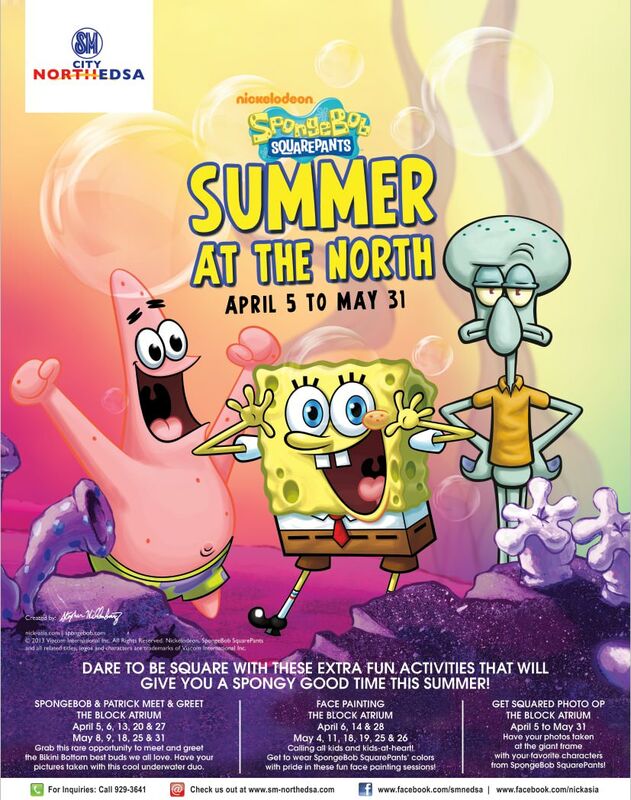 How about spending an afternoon at SM North EDSA for a grand summer SpongeBob SquarePants launch? SM City North Edsa prepared fun and exciting activities from April 5 – May 31, 2013 called, “SpongeBob Squarepants – Summer At The North” which will surely make young ones as well as the young “once” enjoy! There will be a meet and greet event later which I’m really excited about! Meet the famous Bikini Bottom buddies – SpongeBob SquarePants, Patrick Star, Mr. Krabs, Plankton, Squidward and their friends! Come one, come all and experience SpongeBob and Friends’ awesome-filled launch later (April 5) at 4pm at The Block Atrium, SM North EDSA! See y’all! Best Food Forward is back! You are Here >> Home » Events » Ready to see SpongeBob SquarePants?